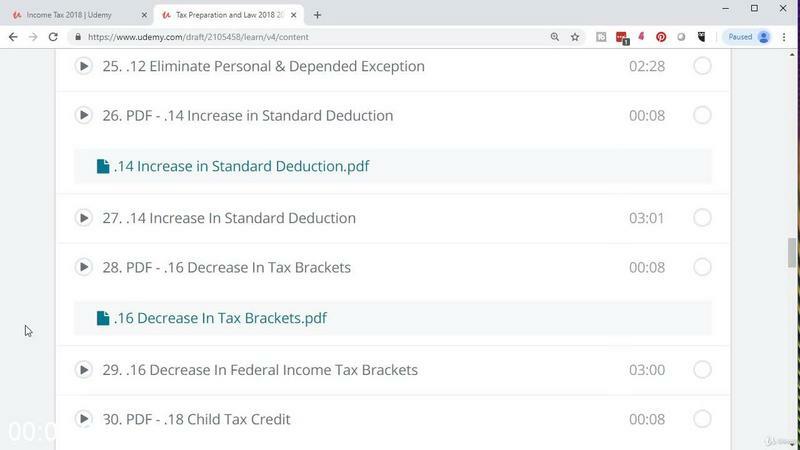 Tax Preparation and Law 2018 2019 - Income Tax | Free eBooks Download - EBOOKEE! Posted on 2019-02-04, by fubber. 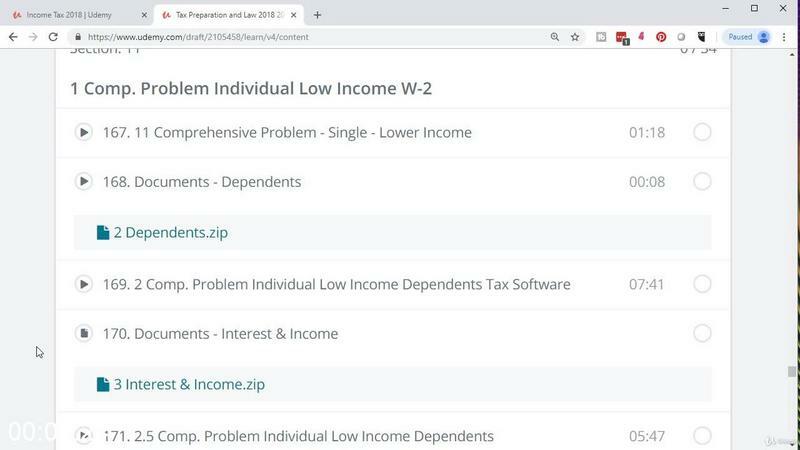 Income tax preparation and understanding for the year 2018 2019 including presentations, downloadable PDF files, practice problems, & and comprehensive problems with step by step instructions, answer keys, and materials. The course will introduce the concept of income tax, tax law, and how it is formatted. We will provide practical examples at every step along the way, giving learners visuals of how the system works, and practice problems to apply the concepts. We will discuss a large number of recent changes to income tax law needed for the filing year end 2019. Both laws and the format of tax forms have changed a lot from prior years. We will provide a visual of those changes so learners can fully understand them. The course will walk through the steps of filling out a tax form. The tax form can be thought of as a kind of income statement or a tax formula. We will break down the formula into its components so that we can digest each small peace at a time. We will discuss the concept of filing status and dependents and how they affect the tax formula. The course will discuss what is included and not included in gross income for taxes. Items included in the gross income calculation may be subject to taxation. Items not included in gross income for taxes will not be subject to tax. 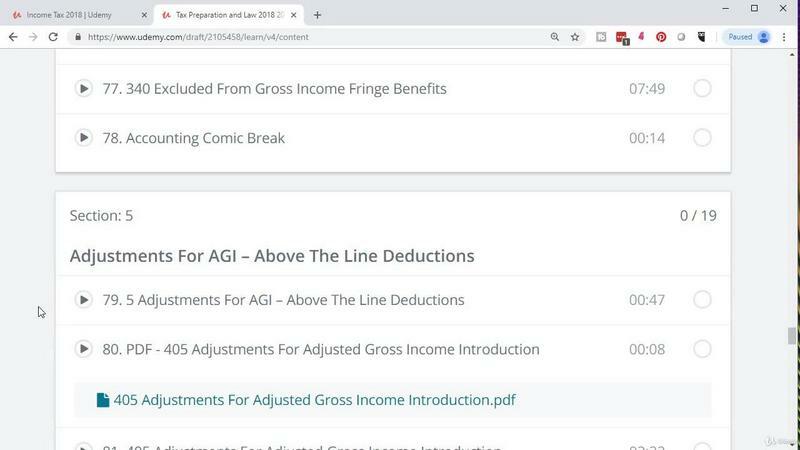 W will discuss adjustments for adjusted gross income, often called above the line deductions. The course will cover the primary above the line deductions and provide practical examples of calculations. 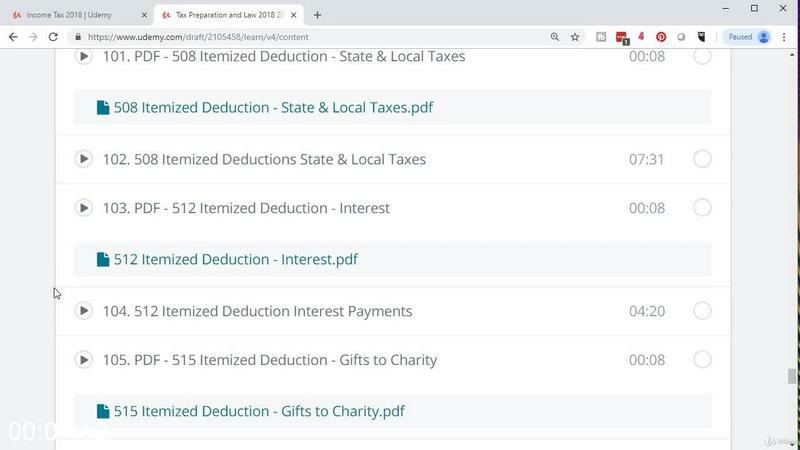 The course will discuss itemized deduction reported on schedule A. We will discuss the primary itemized deductions and provide practical examples of each. We will discuss the reporting of self-employment taxes using Schedule C and the related issues including self-employment tax (social security and Medicare) and the new 20% deduction many small businesses will be eligible for. The course will discuss the calculation of capital gains using Schedule D. We will provide practical examples of the calculation of capital gains. We will discuss the reporting of rental property using Schedule E and provide examples of reporting rental property. 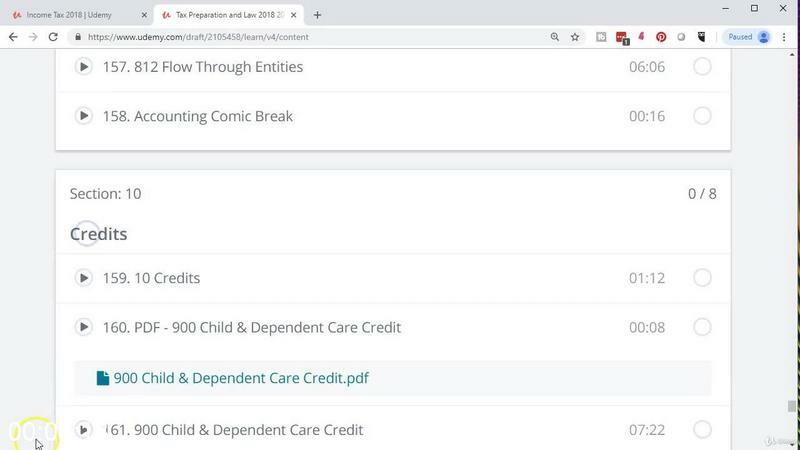 The course will discuss various credits including child tax credit, earned income credit, and education credits and provide examples of each. The course will have comprehensive problems allowing learners to work through the process of filling out a full tax return in a step by step process. Learners can use PDF tax forms provided in the course and available at the IRS website. We also work the problem using the accounting equation and provide learners pre-formatted Excel worksheet to follow along with this process. No comments for "Tax Preparation and Law 2018 2019 - Income Tax".